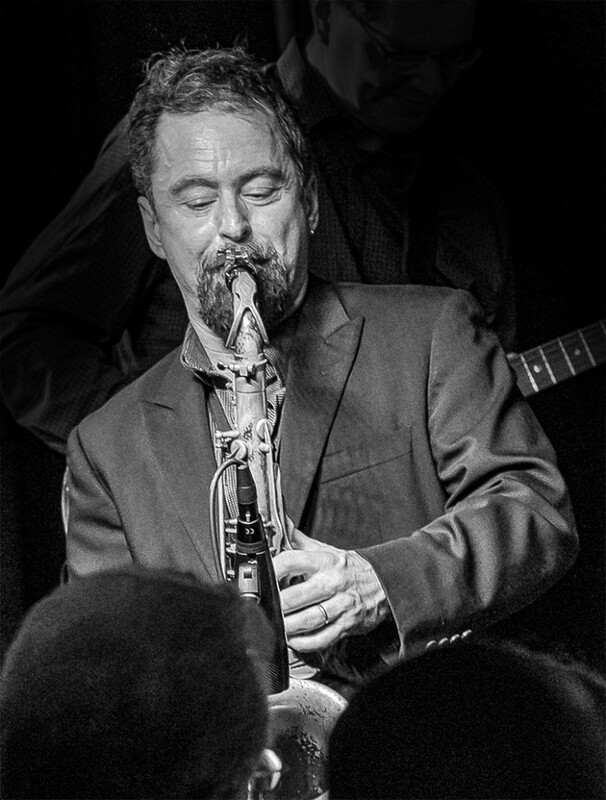 A native of Toronto Canada, saxophonist Pete Mills has received Jazz Performance Grants from the Canada Council and was a recipient of the North Carolina Arts Council Jazz Composer’s Fellowship. Mills has performed in jazz clubs and festivals in the U.S and Canada. Recent engagements have included The Firefly Club, Ann Arbor, Michigan; The Blue Wisp, Cincinnati, OH; with Joe Lovano and the Cleveland Jazz Orchestra at The Cleveland Bop Stop and as part of the Gund Concert Series at Kenyon College. Pete’s performances at jazz festivals include those at the Columbus Jazz Festival, The Newark (Ohio) Jazz and Ribfest and the Toronto Downtown Jazz Festival. In Columbus, Pete performs regularly with the Columbus Jazz Orchestra under the direction of trumpeter, Byron Stripling. Mills’ discography includes 2007’s release Fresh Spin (Summit Records) which features B3 organist Tony Monaco. The disc received enthusiastic reviews in both DownBeat (3 ½ stars) and JazzTimes, was on the JazzWeek top 50 radio chart for 8 weeks. His 2004’s release on Summit, Art and Architecture, which received 4 stars from All Music Guide, was also successful on radio (JazzWeek Top 50 radio chart for 6 weeks) and received airplay on the MTV networks. His first solo release was the critically acclaimed, Momentum (COJAZZ Records). As a sideman he appears on CDs by guitarist Stan Smith (Pathways), saxophonist Chad Eby (Tryptich), the eclectic ensemble Madrugada (Madrugada), the Cleveland Jazz Orchestra (Traditions), the Paul Ferguson Jazz Orchestra and the 2006 Columbus Jazz Orchestra CD, The Colors of Jazz. Active as a clinician, Mills presents workshops on improvisation, ensemble skills and practice techniques at colleges and high schools including the Cincinnati Conservatory of Music, Case Western Reserve, the Brandon (Manitoba, Canada) Jazz Festival, the Ohio Music Educator’s Association Conference, the Columbus Youth Jazz Ensemble, The Ohio State University, Ashland University and Ohio Wesleyan University. Pete holds degrees from the Eastman School of Music and the University of North Texas. His teachers have included Pat LaBarbera, Ray Ricker, Jim Riggs, and Walt Weiskopf. He currently teaches saxophone, improvisation and directs the jazz ensemble at Denison University, having formerly taught at The Ohio State University, Kenyon College and East Carolina University.